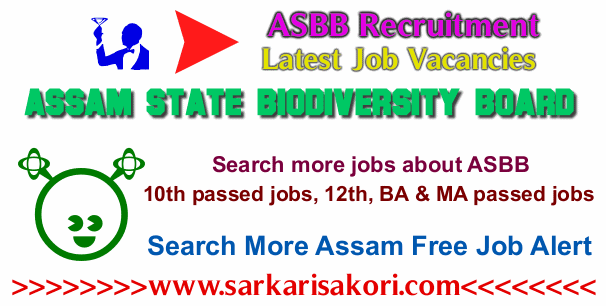 Assam State Biodiversity Board Recruitment 2018 for Coordinator, Assistant, Accounts, Admin & Attendant job under ASBB in Assam Career. Assam State Biodiversity Board Recruitment 2018 notification about for filling up following Coordinator, Assistant, Accounts, Admin & Attendant job under ASBB in Assam Career for a three-year project entitled "IMMHS Him-Nature Learning Centre(NLC)-Assam" funded by MoEFCC under the National Mission on Himalayan Studies. The positions are purely contractual initially for a period of 6 months extendable depending upon performance. No of posts: 02 Nos. Qualification: Candidates should have Ph.D. in Life Sciences/ Mass Communication & minimum 2 years of experience in developing and executing awareness generation programmes about environment and bio-resources. Salary: Rs.31,250 to Rs.35,714/- + CPF benfits Monthly. Qualification: Candidates should have Postgraduate in Botany/ Zoology/ Wildlife Sciences/ Env. Sc./ Geography/ Forestry & at least 1 year of field research experience in related works. Salary: Rs.26,786 to Rs.31,250/- + CPF benfits Monthly. No of posts: 01 No. Qualification: Candidates should be B. Com (Accountancy Major) and must have a working knowledge of Tall + Proficiency in local language. Salary: Rs.17,857 to Rs.22,321/- + CPF benfits Monthly. Qualification: Candidates should be Graduate (B.A/B.Com/B.Sc) and should have at least 2 years experience in office administration + Proficiency in local language. Qualification: Candidates should be HS Pass and should have valid driving licensed for Mcycle/LMV resident of Assa + Proficiency in local language. Salary: Rs.13,393/- + CPF Monthly. Shortlisted candidates will call for a walk in interview. ''To, The Assam State Biodiversity Board, Aranya Bhawan, 2nd Floor, Panjabari, Guwahati- 781037''. Assam Secretariat Admit Card Download. Application Format for the post of ''Programme Coordinator''. Application Format for the post of ''Programme Assistant''. Application Format for the post of ''Support Staff''. All information regarding Assam State Biodiversity Board Recruitment 2018 or ASBB Recruitment 2018 are given above please check them correctly.